Our joint research project with the Managing Partners Forum continues and our topic in February 2014 was practice group management. Specifically, are there particular responsibilities practice group leaders should be taking on in order to drive effective practice management? In addition, what kinds of base level support are firms providing to practice leaders (e.g., job descriptions clarifying the role, training for leaders, etc.)? Coordinating and encouraging professional development and training. Those top responsibilities are depicted graphically below. 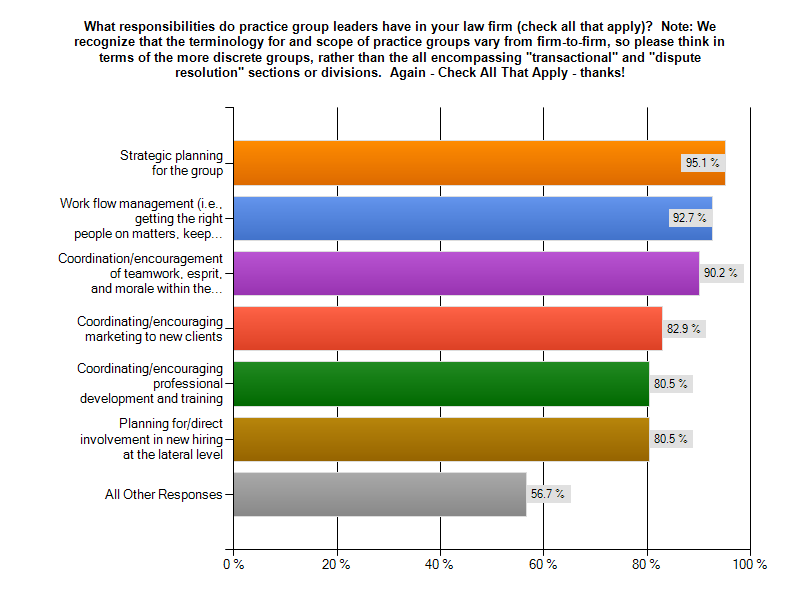 A complete documentation of the results of this survey on practice group management can be found at the Managing Partners Forum web site. We welcome your questions and feedback regarding these findings. Our March 2014 research focuses on best practices in law firm strategic planning. Highlights will be presented here, a full write-up of results will be published at the Managing Partners Forum, and a more in-depth article will be developed for and published in the June edition of Legal Management magazine.